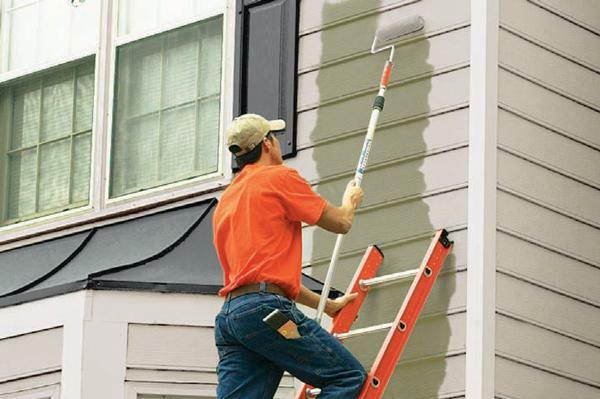 Exterior paint is constantly exposed to the outside elements which cause it to erode, fade, dry out, chip, etc. Extreme weather conditions can also take a toll on exterior paint. This can be a headache when trying to maintain your home’s curb appeal. Noel Painting have compiled some ways to protect your exterior paint from these conditions and in turn expand the longevity of your paint. The sun is a huge culprit when it comes to aging exterior paint. While you cannot get rid of the sun and its UV radiation, you can lessen its impact on your exterior paint. How? Use high quality paints with UV inhibitors. You can also choose colors that are more fade-resistant. Paints made with inorganic red oxides and brown earth tones have superior color retention. Organic colors such as bright reds, blues, and yellows fade a lot faster. Temperature can be a large factor in choosing the type of paint for your project. When shopping, keep in mind your area’s most prominent climate. With today’s technology, paint manufacturers have included temperature ranges for some exterior paints. Ask paint experts at your local hardware store to help you prepare for these temperature conditions before ever applying the paint. Extreme temperature variations can also have a very negative impact, especially if the changes are constant. The surface that has been painted can expand (with heat) and contract (with cold), which leads to cracking paint. The best prevention for this is preparation before even applying paint. Pressure wash your home, use good primer before painting to help with adhesion, fill cracks, and choose the appropriate product. Dirt and grime can easily build up on the exterior of your home, especially in humid climates or those with extra moisture. To ensure that build up doesn’t impact your exterior paint, power wash the exterior of your home on a regular basis. If you notice rust, remove it with a mixture of 1 cup Epsom salt to every 2 cups of water that you use. If mold and mildew have made an appearance, use household bleach on the exterior walls of a 3-to-1 ratio – water to bleach.